I spend most of my time wearing a suit, attending meetings, and interacting with big-shots. In my world, your style and image are very important because you only get one chance to make a first impression. And first impressions often make or break a deal. A timepiece becomes an essential piece of equipment in this world. It takes a mere second or two for someone to glance at your piece and recognize it. But those one or two seconds communicate more information than you can convey in thirty minutes of talking. Whenever I meet someone for the first time (male or female) the very first thing I notice is their timepiece. Their piece can instantly talk to me about the person’s values and priorities and style. For women, I make fewer judgements, but if she’s wearing a Jaeger-LeCoultre, for example, she will score huge points with me. If the guy I am meeting has no watch at all, it’s a strike. He doesn’t appreciate the finer things in life. If he has a bad watch such as a quartz monstrosity, then he also gets a strike. I don’t rule out doing business with him, but now he must try EXTRA hard to win me over. He better know his s__t because he showed very poor judgement by coming into my office wearing a variety-store disaster on his wrist. Now, obviously, it works both ways. If I “judge” people by their timepiece, then I must assume they will do the same. I must carefully choose my piece for each occasion, each day or each big meeting. It’s like choosing a weapon for battle. You can already guess that I need a few pieces to choose from because I must choose different styles and colours for different suits and jackets. As well, different brands may be needed in different circumstances. So how do you choose the right piece on a given day? I trimmed down my collection considerably last year on my way to acquiring a limited edition Panerai Luminor. So now I have fewer tools to work with. But I have chronographs, divers, brown leather strap, black rubber, etc. And my collection are not high end Patek-Philippe or Blancpain. I can’t face off against an Audemars-Piguet. But I think I can hold my own in a power meeting. The Panerai, obviously, is my power piece. This is my statement piece and, worn on its “assolutamente” brown leather strap, it is the perfect complement to a blue suit and brown shoes. When I wear brown suits, or when I want a sportier look, or for casual occasions, I have my TAG Heuer Aquaracer chronograph. And if I am wearing black or grey or charcoal, and IF I want to make a real statement, I like to use my Bell & Ross BR02 on black rubber. 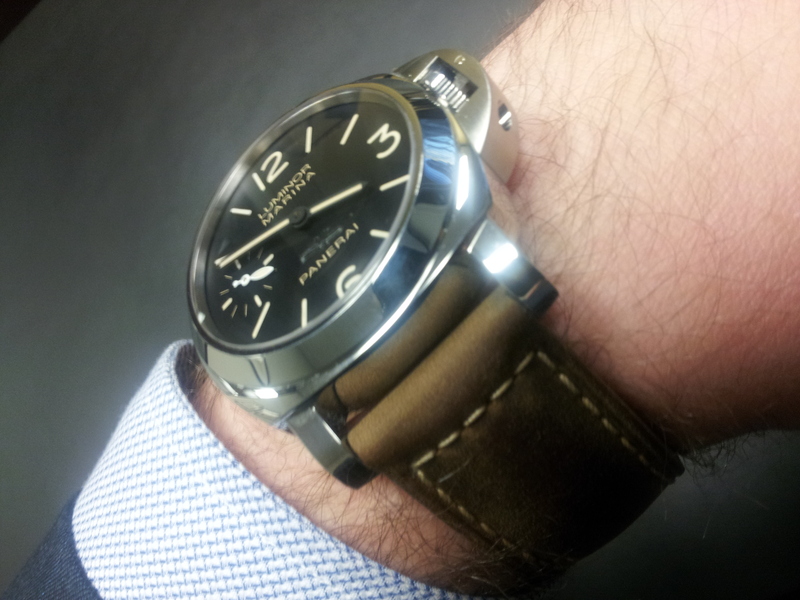 I can also switch my Panerai to a black rubber strap if the occasion calls for it. I could go on… but you get the point. It’s not all a question of big budgets and extreme price tags. 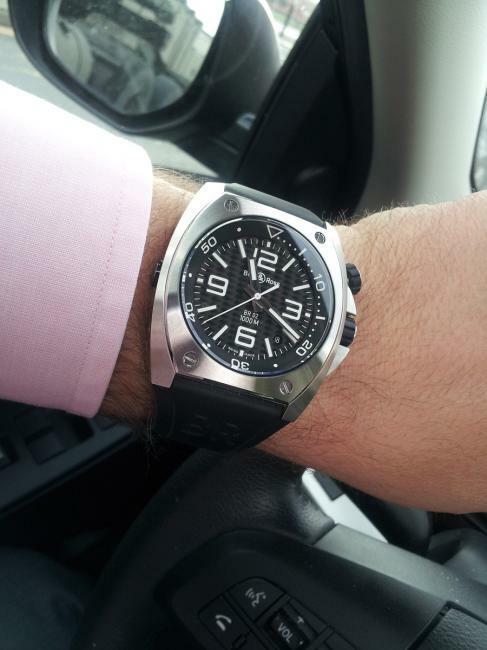 I am actually working on a blog post about the very best watch under $1,000, which would certainly earn my respect. It’s about putting some thought into what goes on your wrist each day. Don’t just automatically grab that plastic wrist-junk that you mow the lawn with. Invest some time and money into one, or a few, proper mechanical timepieces. Build a small collection of pieces for different styles and occasions. Consider your outfit when choosing a timepiece for the day. I actually choose my piece first and then build my outfit around that piece. Remember – if you’re going to be meeting people for the first time, they may notice your timepiece and form first impressions. Make sure they get the RIGHT impression.